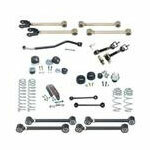 Jeep lift kits come in a variety of shapes and sizes. There are short-arm lifts, long-arm lifts, and spacer lifts. Some suspension lift kits come with shocks and track bars, while others don't...do your research here and make sure you find the kit that's best suited for your Jeep as well as your driving habits.